The 1920's was a time of change. The Stock Market plummeted, women's style revolved, and the Prohibition was issued. Obtaining alcohol became difficult to Americans. So nightclubs called "speakeasies" began. Speakeasies were established so people could enjoy socializing while drinking alcohol. One of the most famous Speakeasies in Harlem, New York was Cotton Club Besides drinking and socializing, Cotton Club was a hub for jazz music and entertainment. Though Blacks were the source of entertainment, musicians, singers and dancers, whites were allowed to come and enjoy. Performers included Louis Armstrong, Cole Porter, Ethel Waters, Bing Crosby, and many others. 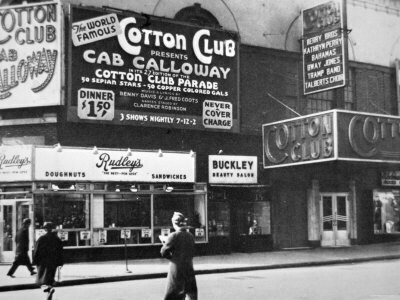 In 1935, Cotton Club was forced to shut down because it was seen as unsafe for whites. It re opened in September of 1936 and ran until 1940! Attending these night clubs allowed whites to talk with blacks and drink, something that was not allowed at the time. Jazz became a sensation in the 1920's so much that the 20's was also referred to as "The Jazz Age." The existence of the nightclub was brought back to life with Francis Ford Coppola's film The Cotton Club .